I am in a bit of a muffled groggy mood today, but I have to remark on the fact that robins have been sighted in the area! They are a true sign of spring. yay! The image is only half true. I don't have cute blue shoes like that, the cats don't go outside ( poor deprived creatures) and I don'y have a heart stitched on my t-shirt. 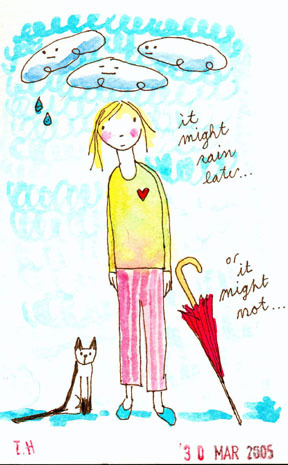 Otherwise, I think I did hear it may rain. Or it may not. This is an amazing find from my friend Liam. 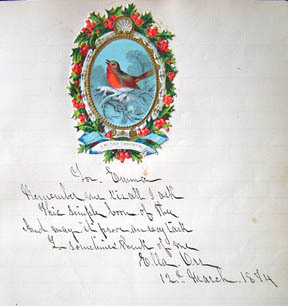 An autograph book owned by a girl named Emma from Toronto in 1874! When he emailed me the link, he called it a 130 year old blog. It really is in a way. People have always loved to keep things like this I guess. It is so interesting to think of a girl who lived here so long ago. I wonder if she was happy to see the first robins in spring? I second what Aimee said. Lovely post with a lovely sketch! And Emma's autograph book is a such a sweet find. Makes you wonder who will be looking at all of our stuff a 100 years from now. what an incredible find! should we be printing out our blog entries and saving them in time capsules?! Oh my goodness, what beautiful hand writing!! So funny. It might rain. And it might not. And Emma's "blog" is quite a treasure. So neat. I am always so intrigued by old journals and older penmanship! love the blog and your drawings. How cool ... an autograph book! I may be a geek but I have always loved the Little House on the Prairie books... when Laura Ingalls was a teenager these types of books were all the rage (1880's). Very very cool! Wow, what a find! Isn't it just amazing?! It just wouldn't be the same for someone to "find" one of our blogs in 130 years, would it?